Taurus November 2017 Horoscope predicts that majority of the planets are in the Northern sector of the horoscope and Career Planet Uranus is in forward motion from the 16th of November 2017. Career issues will overshadow family and psychological matters this month for the Taurus zodiac natives. The November 2017 horoscope also forecasts that planetary power is located in the Western half of the chart this month. Hence situations for the Taurus sun sign are not under their control. You can attain your goals with the help of others and by building a consensus. Others come first and your personal ambitions will be in the background. Flexibility will be necessary and compromises have to be made in November 2017. In November 2017, the bulls will get opportunities for overseas travel, higher education and for enhancing your spiritual awareness. The 2017 horoscope predicts that professionally you can advance as per your targets in November 2017. Growth will be excellent. There will be some minor obstructions after the 22nd for progress in business. The Taurus November 2017 monthly astrology forecasts suggest that all major investments and expenses should be done before the mid of the month. Important monetary activities can be taken up at a future date when Mercury becomes favorable for the Taureans. This November month you should review your present financial strategies and make necessary improvements. Taurus earnings will increase by helping friends and family members become more affluent in November 2017. You should clear pending loans with the surplus money you have generated. There will be no problem for getting investors for new financial ventures and your earnings will be augmented by your social contacts. Read about symbolism of money. 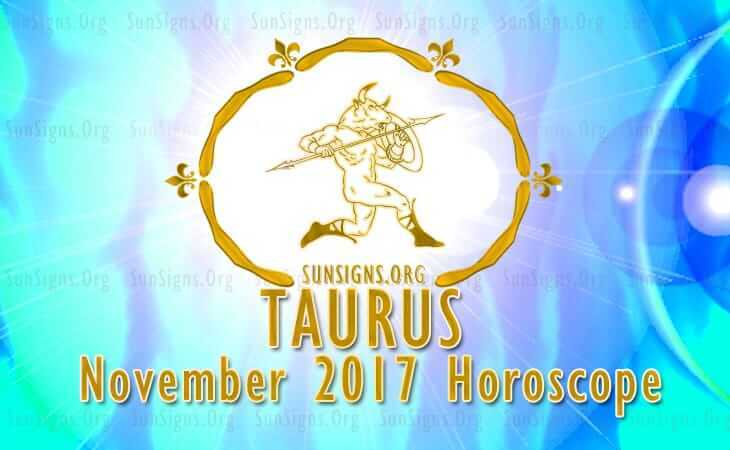 The Taurus monthly predictions for November 2017 forecast that socially this will be a lively month with plenty of partying and social activities. This will give singles plenty of opportunities to get into love relationships. Love is to be found in highly intellectual and influential circles for the Taureans. Get Taurus dating tips. Family environment will be happy and harmonious in November 2017 for the Taurus personality. There will be many family get-togethers. Love is in the air within the family. There will be clarity in your existing relationships and good ones will endure. There might even scope for expanding your family with the birth of child or marriage in November 2017. The Taurus health is quite fragile and you have to be careful in November 2017. Rest and relaxation are required to stay physically fit. You have to work smartly and delegate unimportant things to other people to reduce stress. Do not neglect issues like toenail fungus or itching eyes. The November 2017 Taurus horoscope this is the right time to review your financial dealings and make some important career related decisions.